April 23, 1930: Frances (Judy) and her two sisters performed at the “Third Annual Antelope Valley Jubilee,” held at the Lancaster High School auditorium in Lancaster, California. 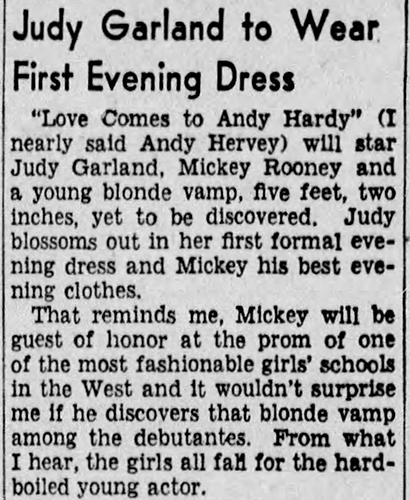 April 23, 1938: In her column, Louella Parsons notes that Judy was set to wear her “first evening dress” in the upcoming production of Love Finds Andy Hardy. 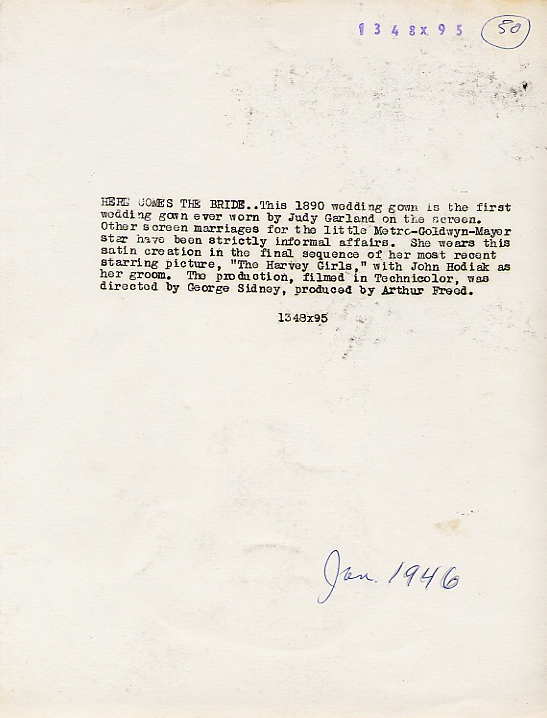 Judy began work on the film that May. The “blond vamp” Parsons talks about ended up being played by Lana Turner, a new contract player at the studio who made quite a name for herself at the studio. 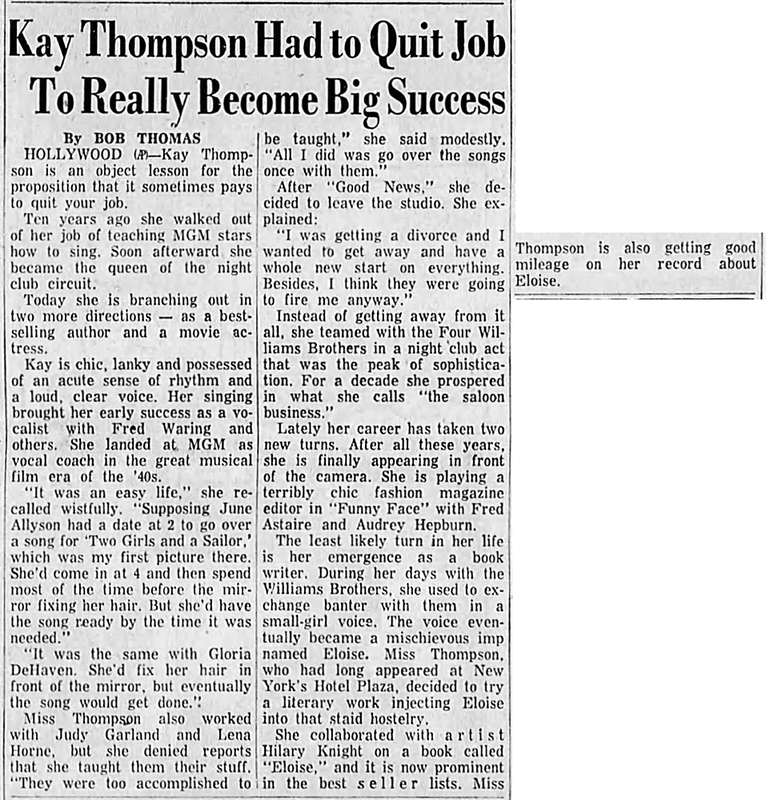 April 23, 1940: Louella Parsons’ column reported on a recent tennis fundraiser for the British War Relief that Judy took part in. 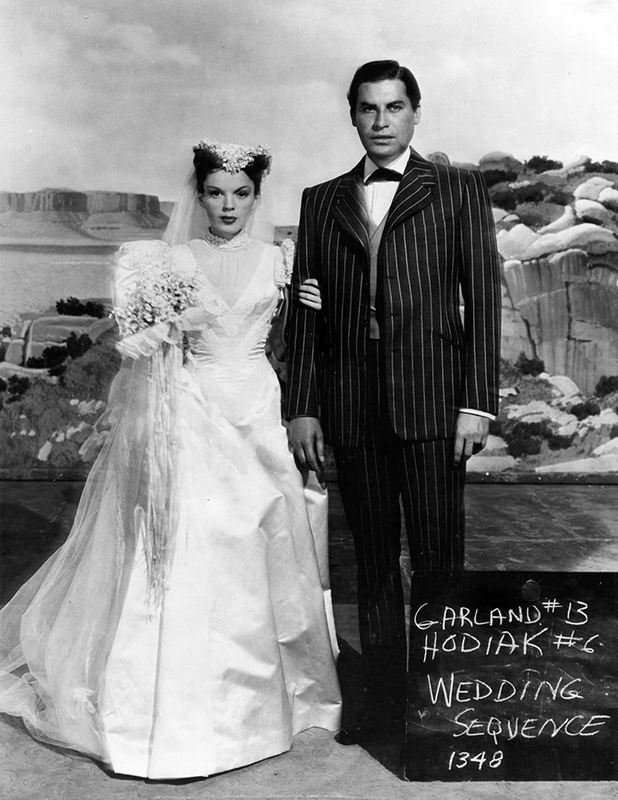 The event took place on Sunday, April 21, 1940, which was Judy’s only day off during the week although this event didn’t give Judy a real “day off.” The preceding week was devoted to working on Strike Up The Band, including rehearsing the “Gay Nineties” number as well as the start of filming on April 19th which consisted of filming scenes on the “Interior Library” set. Most days lasted from 9 a.m. through 6 or 6:30 p.m.
Several pictures of the tennis event were taken including those shown here. The caption (provided by MGM who sent a photographer to the event) for the photo above reads STARLETS AT TENNIS … Judy Garland and Paulette Goddard against Lester Stoeffen and Bill Tilden, at the tennis matches staged at the Ambassador Hotel in Los Angeles for British War Relief. 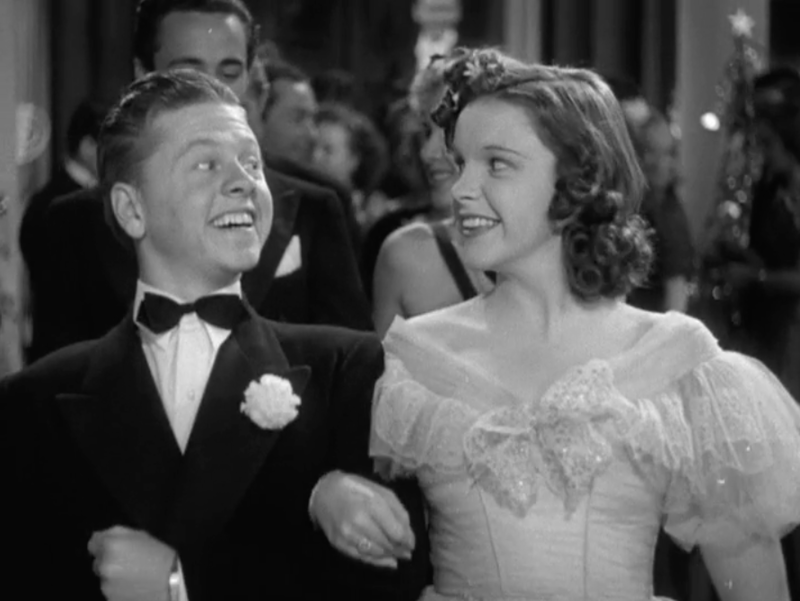 Miss Garland and Mickey Rooney took time off from their work at Metro-Goldwyn-Mayer for the matches. 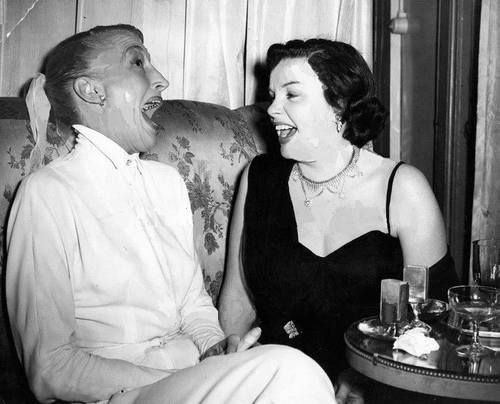 Left to right, Lester Stoeffen, Judy Garland, Paulette Goddard and Bill Tilden. On this day (April 23) at MGM Judy was at work on Strike Up The Band pre-recording the “Nell of New Rochelle” production number with the rest of the cast. 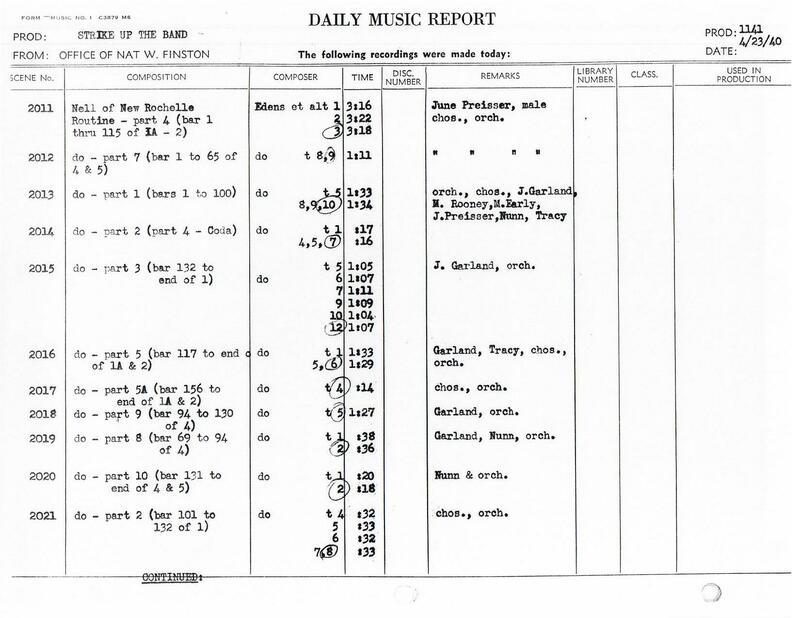 This is the date given for Judy’s deleted solo of “The Curse of An Aching Heart” when in reality she pre-recorded that short rendition on July 10, 1940. The 19-minute sequence includes excerpts from “The Sidewalks Of New York (East Side, West Side)”, Walking Down Broadway”, “Light Cavalry (Overture)”, “After The Ball”, “I Just Can’t Make My Eyes Behave”, “Over The Waves”, “Heaven Will Protect The Working Girl”, “While Strolling Through The Park One Day” (aka “The Fountain By The Park)” (deleted), “Home Sweet Home”, “Flower Song”, “Ta-Ra-Ra-Boom-Dee-É”, “Father, Dear Father, Come Home With Me Now”, “Wintermarchen”, “Curse Of An Aching Heart” (deleted), and “Jingle Bells.” The complete sequence was included on the 1995 Rhino Records 4-CD set “Mickey & Judy – The Judy Garland & Mickey Rooney Collection” which is to date the only comprehensive collection of the soundtracks to all four of the Rooney/Garland film musicals. As if that wasn’t enough work, later that evening Judy made her weekly appearance on “The Pepsodent Show Starring Bob Hope” on NBC Radio. No information is known about the show other than the fact that jazz bandleader “Skinnay” Ennis and series regular Jerry Colonna also appeared. It’s safe to assume that Judy sang two songs as she usually did. 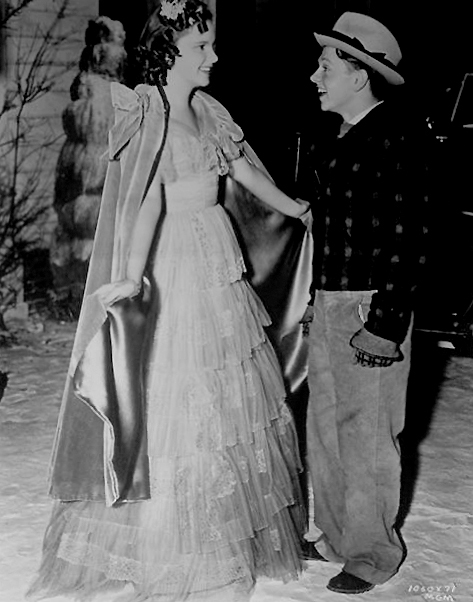 April 23, 1943: Filming on Girl Crazy continued with more scenes shot on the “Interior Assembly Hall” set. 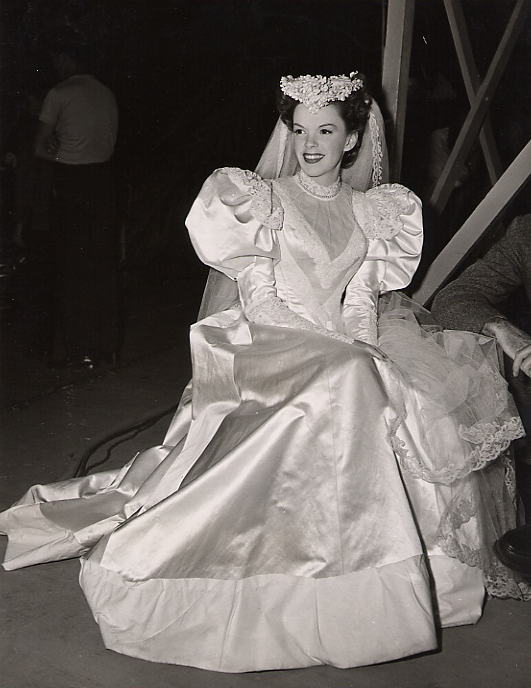 Time called: 10:00 a.m.; Judy arrived at 10:35 a.m.; dismissed: 5:40 p.m.
April 21, 1945: Filming continued on The Harvey Girls with a rehearsal of the “Wedding Procession.” Judy also pre-recorded a short version of “In The Valley” which is not in the film. 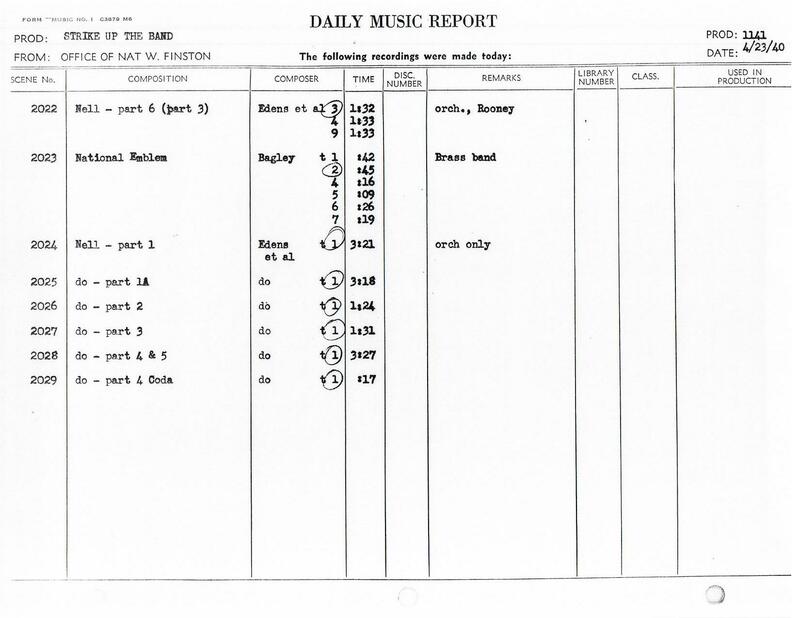 It’s noted that this is the recording she made with Kay Thompson although Kay’s not listed on the Daily Music Report. My belief is that the recording of Judy and Kay fooling around is all that survives from this day and that there was, in fact, a solo recording of Judy with Roger Edens at the piano. The recording with Kay is 1:29 minutes long. 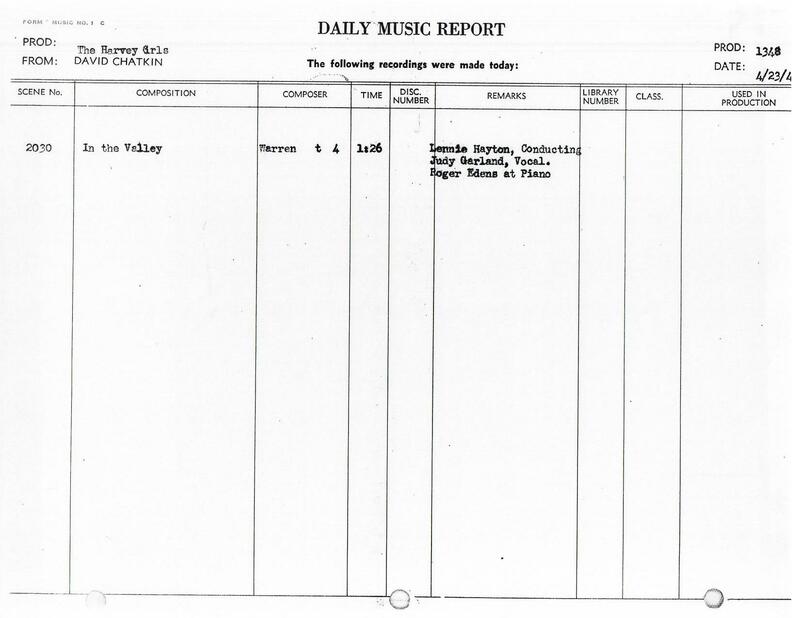 The recording noted above is only 1:26 minutes long and that includes the audio scene number notation before and after the take. Wedding photos provided by Kim Lundgreen. Thanks, Kim! April 23, 1947: Filming on The Pirate continued with scenes shot on the “Interior Manuela’s Rec Room.” Time called: 10:05 a.m.; Judy arrived at 10:15 a.m.; dismissed: 5:45 p.m.
April 23, 1949: Annie Get Your Gun filming continued with the “U.S. and European Montages” scenes. Time called: 8 a.m. in makeup; Judy arrived at 7:50 a.m., 10 minutes early; due on set: 9 a.m.; arrived at 9:42 a.m. at Backlot #3; ready at 9:57 a.m.; lunch: 12:00-1:00 p.m.; time dismissed: 4:35 p.m. The footage for these scenes no longer exists. April 23, 1955: In his “Platter Chatter” column for “The Chicago Tribune” columnist Fred Reynolds didn’t care too much for the soundtrack record for The Pirate which was recently reissued by MGM Records as part of their new “2 Big Original Cast Musicals” 12″ long playing records featuring two soundtracks on one record. Oddly enough, Reynolds didn’t mention Summer Stock at all. 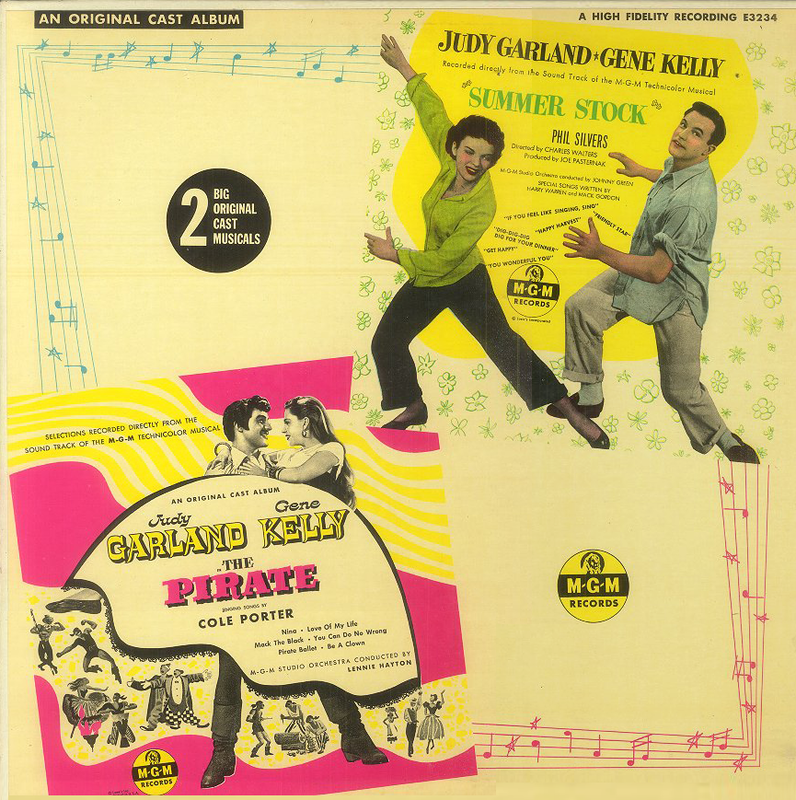 Check out The Judy Garland Online Discography’s Summer Stock/The Pirate LP page here. Kay was Judy’s lifelong best girlfriend and Godmother to Liza. Photo: Judy and Kay after Judy’s opening at the London Palladium on April 9, 1951. April 23, 1958: Judy received a clean bill of health. It didn’t last too long. Judy entered Doctor’s Hospital in New York City on November 18, 1959, with a life-threatening case of hepatitis. She almost didn’t recover but thankfully she did! April 23, 1961: “The Greatest Night In Show Business History” occurred when Judy took the stage at New York’s Carnegie Hall. The concert was a stunning success as well, of course, and the apex of Judy’s 1960/61 concert tour. Gone were the vaudeville trappings of her previous shows, it was all Judy and the band in what was, to steal a phrase from Time Magazine’s review of Judy’s 1954 masterpiece A Star Is Born, “the greatest one-woman show” in history. “Judy at Carnegie Hall” was and is the gold standard by which all other one-woman concerts would be judged. Brilliantly arranged and conducted by Mort Lindsey, “Judy at Carnegie Hall” was recorded by Capitol Records and the resulting 2-record set was a stunning success, spending 13 weeks in the #1 spot upon its release that July, and winning 5 Grammy Awards. It has never been out of print. Listen to the complete original album here (zip file). For information about all of the various releases of the album check out The Judy Garland Discography’s “Judy at Carnegie Hall” pages here. 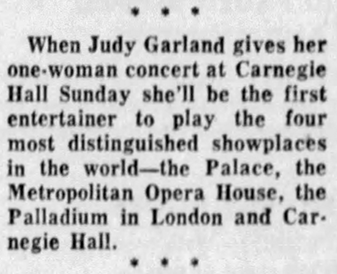 April 23, 1962: On the one-year anniversary of “Judy at Carnegie Hall” Judy reminisced about the concert on the live radio show “Make Believe Ballroom” broadcast out of New York. April 23, 1965, to May 3, 1965: Judy and Mark Herron returned to New York on April 23, catching a 2:35 flight from Charlotte, North Carolina (where Judy had just given a concert), and then spent several days rehearsing some new songs for her next concert. Judy and Mark also went to some film premieres in New York, including Ship of Fools. In a phone interview on May 3, with Ann Masters of the “Chicago American,” Judy said she would be doing “some new albums, at least one of them will be with Liza.” Unfortunately, those never materialized. Photo: Liza, Judy, and Mark Herron on December 19, 1964.